Your subscription will renew automatically. Subscriptions start on the purchase date and will automatically apply the charge to your original form of payment on the anniversary date of the following renewal period (month, quarter, or year). What happens if the price of a subscription changes while I am still subscribed? If you continue your subscription, uninterrupted, your original pricing will remain the same. If your subscription is cancelled or expires, you will need to pay the current retail price for any new subscription. Can I get a partial refund for a purchased subscription if I cancel mid-month, mid-quarter, or mid-year? No refunds will be processed. If you cancel at any subsequent time, your subscription will continue until the end of the current term. Your credit card will not be charged again after you cancel your subscription. You can cancel your subscription at any time by visiting your My Accounts page, which was set up during your product checkout. Once your subscription has been canceled, you will not be billed on the next scheduled date for your monthly, quarterly, or yearly subscription. We do not prorate subscriptions even if you choose to end it prior to the next scheduled billing date. How can I submit feedback on a Practice Test question? The CXU Practice Test questions are regularly reviewed for accuracy and quality. Due to the different opinions of CX professionals and the variety of customer experience methodologies used across organizations, as well as frequent changes in the industry, it is possible to encounter a question/response that may need further review or an explanation from one of our experts. If this happens to you while using one of our test products, please contact us immediately. Send the test content area with question number to our Testing Administrator. What is the process for earning college credits? What type of assignments must I complete, and are there any deadlines? All of our Online Courses are housed entirely online through our Learning Management System (LMS). You will be able to login and view the lessons, read articles, watch videos, and complete lesson activities. Additionally, you can access CXU’s practice test questions at the end of each course through our online testing portal. Since many of our learners are professionals, we respect the use of their time by not setting any assignment deadlines or mandating their completion. As long as you continue your subscription, you will have access to Online Course materials and practice tests to learn at your own pace. Is there a final exam for the courses? Yes, there is a final exam. In order to be approved to receive college credits, you will need to score an 80% or higher on 1 cumulative exam that covers the 6 core concepts of Customer Experience or 4 core concepts of Patient Experience. The exam is a 2-hour timed assessment that contains 70 Multiple Choice questions and is completely online through CX University’s testing website. You will receive your score immediately following the completion of the exam. Which courses at CX University offer college credits? Currently, our Online Courses in for the 500 Series in Customer Experience and Patient Experience are approved for 6 college credits. You must purchase a subscription for the CX500 Series or PX500 Series in order to be eligible for college credits. You must also purchase the College Credit Add-On in order to be officially on the college credit track. You can earn 6 college credits for completing the CX500 Series of Online Courses in Customer Experience or PX500 Series of Online Courses in Patient Experience and passing the final online exam. Can I receive partial credits? At this time, CX University can only offer a full 6-credit option. What are the college credits counted towards? You can count your college credits towards your degree program as long as your receiving institution will accept the transferred credits (always check with your institution to confirm this). Additionally, some professionals can count the college credits towards approved professional development hours. Check with your employer to ensure that this is an acceptable option to them. What is the granting institution for my college credits? You college credits are granted by Montgomery County Community College, a higher education institution accredited by the Middle States Commission on Higher Education. Can my college credits be transferred to another institution? Since the credits are granted by Montgomery County Community College, most colleges and universities will accept these credits. However, it is highly advised that you check with your receiving institution before purchasing the Online Courses at CX University to ensure that they will accept these credits. It is also recommended that you are informed by your receiving institution if these credits count towards your degree program. How long will it take me to earn my college credits? To earn your college credits, you need to complete the all 6 Customer Experience courses in the CX500 Series or all 4 Patient Experience courses in the PX500 Series. Since the courses are online and self-paced, you can determine how quickly you want to complete the courses. As long as you continue your subscription, you have no time restraint to complete the online courses and take the final exam. Transcripts can be requested 24/7 online. Electronic transcripts are delivered immediately. However, if you need a hardcopy, you will need to request a copy of your transcript by contacting Montgomery County Community College through their Clearinghouse at transcripts@studentclearinghouse.org. *Remember to allow time to process your credit approval upon completion of the final exam. CX University will communicate with Montgomery County Community College directly to grant you the credits earned. How long will it take for me to receive my transcript? Credits are processed as soon as Montgomery County Community College receives the request and will appear on the transcript within 2 business days. Once it’s available, you can get it electronically immediately. How are the college credits listed on the Montgomery County Community College transcript? The credits will be listed as a six-credit block as MGT 999 for matriculated students (students in a related degree program). How much does it cost to earn college credits with CXU’s courses? You must pay for the basic or upgraded subscription and then choose the College Credits Option add-on during checkout. To see the current listing price, visit our product page. Can tuition be reimbursed by a 3rd party organization? They can provide you with the funds to make the purchase online through our shopping cart. They can contact us to pay CX University directly on your behalf. Can I use financial aid (like my Pell Grant) to pay for the courses? Financial aid cannot be granted to “guest” students, which is how all CX University learners are classified according to the CXU-Montgomery County Community College agreement. Are there any additional costs to the program, besides paying for the courses? Other than the College Credits Option add-on, there are no required books or materials for our courses. All you need is your device (computer, tablet, smartphone) and internet connection. To see the current prices, visit our product page. Can I pay for the courses now and then request and purchase the college credits later? If you are unsure that college credits are right for you now, you can still purchase the subscription for access to the CX500 Series of Customer Experience Online Courses or PX500 Series of Patient Experience Online Courses and later on purchase the college credit add-on to be placed on the college credit track. You will receive an email from CX University confirming this additional purchase. How do I enroll in the certificate program? Enrolling in the Customer Experience Specialist (CXS)™ and Patient Experience Specialist (PXS) certificate programs require the purchase of a basic or upgraded subscription to access the Online Courses in the applicable discipline of interest (Customer Experience or Patient Experience). You will automatically be given the option to take the certification assessment when beginning your subscription, but you must complete all courses for the CX or PX Program. How much does it cost to earn the certificate? The cost to earn the Customer Experience Specialist (CXS)™ or the Patient Experience Specialist (PXS) Certificate is included in the cost of the subscriptions to our online courses. What are the requirements for earning the certificate? You must complete the applicable series of online courses: CX500 Series for Customer Experience and PX500 Series for Patient Experience. You must then score 80% or higher on the Customer Experience Specialist (CXS)™ or Patient Experience Specialist (PXS) certification exam, which you will have 2-hours to complete a 70-question, online Multiple-Choice exam and score 80% or higher to earn the certificate. As long as you continue your subscription, you have no time constraint to complete the online courses and take the final exam. What is the difference between the CXS and PXS? 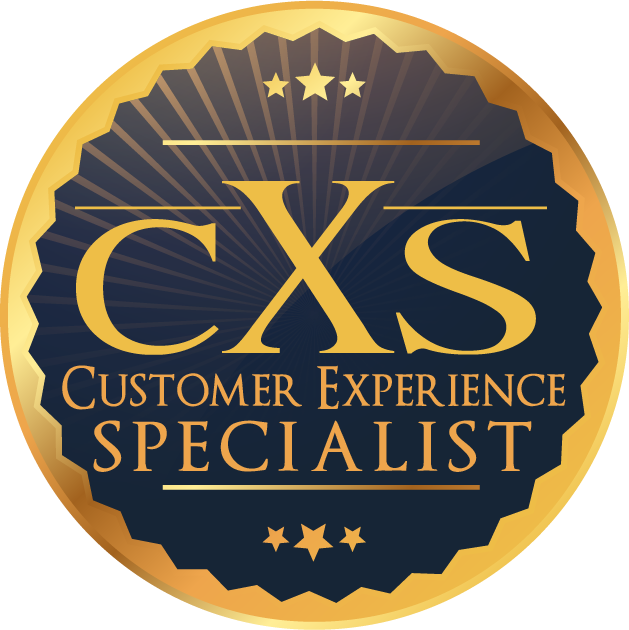 CXS is Customer Experience Specialist and is for those who are seeking information and applied concepts in the Customer Experience discipline. 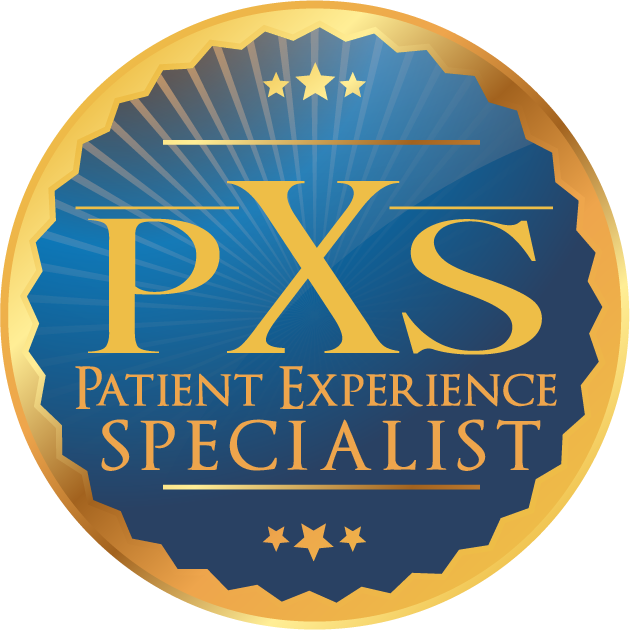 PXS is Patient Experience Specialist and is for those who are seeking information and applied concepts in the Patient Experience discipline. Certification is imperative if you are currently part of a business or an organization whose purpose is serving customers or patients. Nearly all Fortune 500 companies, hospitals, and other organizations are in need of employees with customer or patient experience credentials. Will I receive a tangible certificate upon completion? Yes, once you complete all the Online Courses in either the CX500 Series or PX500 Series and score 80% or higher on the Customer Experience Specialist (CXS)™ or Patient Experience Specialist (PXS) exam, the applicable certificate will be sent to you via email for you to save and print. Additionally, you will receive a Customer Experience Specialist (CXS)™ or Patient Experience Specialist (PXS) badge as a png file to upload as your email signature or place on your social profiles or website. How long will it take for me to earn the certificate? Everybody’s pace varies according to their learning style, time commitment, and any other extraneous variables. Additionally, each Online Course from the 500 Series provides a comprehensive amount of information in the form of lessons, videos, articles, and hands-on activities that you can study in a depth of your choosing. As long as you continue your subscription, you have no time constraint to complete the online courses and take the final exam. Do I need to attend any face-to-face trainings to earn the certificate? No, you are not required to attend any face-to-face trainings to earn the certificate. The Online Courses and certification exam are hosted online and can be accessed from any device that has connection to the internet. Do I need to take an exam to earn the certificate? Yes, you will have to take a 2-hour timed exam containing 70-questions written as Multiple Choice options and score 80% or higher to earn the certificate. How can I showcase my certification? Once you receive your Customer Experience Specialist (CXS)™ or Patient Experience Specialist (PXS) certificate, you may showcase your badge as your email signature or place on your social profiles or website by uploading the png file. What are the official seals of the CXS and PXS? Once you are awarded the certificate, you will also receive a badge to upload and showcase in your email signature or on your social profiles or website. Who can I contact if I have questions about the certification? If you have a question at any time related to Customer Experience Specialist (CXS)™ or Patient Experience Specialist (PXS) certification, please contact our help desk. What happens if I do not pass the certification exam? If you score below 80%, then you will not pass the exam or earn certification; however, you have the option to retake the exam as long as your subscription remains active. An Online Course is a highly interactive course that is administered through the Internet. You will have comprehensive lessons focused on a specific Customer Experience topic along with videos, seminal articles, case studies, and hands-on activities (called Playbooks). You also have the chance to check your knowledge at the end of each lesson. Once I pay for a course, will there be any other costs involved? Not unless you choose to upgrade your subscription or choose one of our add-ons. How long do I have access to my Online Course? How many hours should I plan to invest to complete a course? Everybody’s pace varies according to their learning style, time commitment, and any other extraneous variables. Additionally, each Online course provides a comprehensive amount of information in the form of lessons, videos, articles, and hands-on activities. Some individuals choose to go into depth in each area, whereas other people review information they find most pertinent to them. Do I have to take courses in a particular sequence? There is no strict sequence of courses, although they are listed as 401-406 or 501-506. The ECX400 Series is designed for busy professionals who need applicable training for their work in Customer Experience. The CX500 or PX500 Series courses are comprehensive in order to teach mastery of Customer Experience or Patient Experience disciplines. Will the courses help me to take the CCXP exam? Yes, specifically the CX500 Series of Online Courses will help you become better prepared to take the CCXP exam because they cover the 6-Core Competencies of Customer Experience in depth. You have to be approved to take the CCXP by the Customer Experience Professionals Association (CXPA). What benefits will I receive by taking CXU courses? You will acquire knowledge, abilities and skills to perform your job better. You will be better prepared to influence CX initiatives and their outcomes in your organization. You will gain confidence and make valuable contributions to your organization. You will be on your way to becoming a certified Customer Experience professional. You will be able to learn in a convenient online and self-paced manner. What do I need to take your courses? Essentially, you need access to the Internet and an operable computer, laptop, tablet, or smart phone. Do I have to physically attend classes? No, this is a web-enabled program that does not require you to physically attend any classes. You can complete the Online courses at your convenience from anywhere and at any time. Do I need to obtain any materials on my own to take this course? No, CXU will provide you with reading materials, case studies and supporting videos. What should I do if there are technical problems while I am in the program? In the event that users experience technical difficulties while in the CXU learning platform (through e360), please select your HELP tab from the top toolbar. Here you are able to create a help ticket by selecting the User Help Desk tab located in the left hand navigation panel. The HELP page also gives users access to an online and PDF version of the system manual as well as video tutorials for all tools and features. If users are unable to log in they may send an email to the LMS Coordinator. What if I cannot hear or see the videos or am unable to download articles? If users are unable to view videos or download articles, a help ticket should be created within the HELP tab located in the top toolbar in the LMS platform. If a user forgets their username they may email our LMS Coordinator. If a password has been forgotten, users may select the Forgot Your Password? link located on the CXU log in page. What kind of questions are a part of the Practice Tests created by CX University? The questions are designed to help you review and measure your CX knowledge in the 6-Core Content Areas of Customer Experience. The questions have been developed by CX University and are designed to help you review, measure, and learn about your understanding of the Customer Experience discipline. Some individuals use the CCXP Practice Tests as a review for the CCXP Certification exam. Please note that the CCXP exam is created by the CXPA and not CX University. Therefore, all of the CCXP Practice Test questions are wholly developed and delivered by CX University. What is CCXP and CXPA? CCXP stands for Certified Customer Experience Professional. It is a professional certification offered through the CXPA (Customer Experience Professionals Association). CX University is a proud Authorized Resource Training Provider (ART) of the CXPA. Will accessing the Practice Tests help me pass the CCXP Certification exam? Yes. The questions in the CCXP Practice Tests will help you prepare to pass the CCXP exam. If you want additional preparation, CX University also offers Online Courses and Custom Workshops. Can I view a free sample of the Practice Tests? Yes. CXU offers a 30-Question CX Quotient (CXQ) Assessment. You can complete the CXQ here. The results of the free CXQ Assessment will also be available immediately on the webpage in which you take the sample test. Currently, there is no PX Quotient Assessment available. How do I sign up and pay for Practice Test access? You can purchase either the CX or PX Practice Test Program via our shopping page. Purchase the CX Practice Test Program or the PX Practice Program. Once you purchase the test program, you will receive an email with access credentials to the CXU Learning Management System. In addition, Practice Tests are FREE to all CXU students who have subscribed to our Online Courses. How many questions are in each Practice Test created by CX University? There is one 100-question review for EACH Customer Experience Core Content Area for a grand total of 600 unique questions. There is one 100-question review for EACH Patient Experience Core Content Area for a grand total of 400 unique questions. Questions are randomly selected to avoid repeated questions. Is the Practice Test a timed test? No. You are NOT timed while you answer the questions. The CXU Test site offers uniquely developed and comprehensive CX questions in the form of multiple choice options. Please note, however, the time limit you have is 30 days of access to the CX University Core Content Review questions. You must answer the questions during that time period. However, subscribers to our courses have access as long as the subscription is in effect. Can I stop answering questions in the middle of my Practice Test and resume it later? Yes, as long as it is during the 30-day time period. However, after the 30 days, you will no longer have the ability to answer or review the questions. What happens once I complete one of the Practice Tests created by CX University? You will receive immediate results showing all questions along with the correct answers. In addition, you will receive a score showing the percentage and number of questions answered correctly out of 100.